Teletalk 1GB 21 TK Recharge Offer with 30 Days Validity. 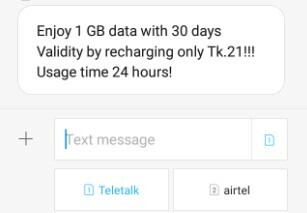 All the Teletalk connection users who get a message from “TELETALKMKT” same the below picture, they are eligible to enjoy Teletalk 1GB Internet 21 TK Recharge Offer with Validity one month. If you get this Teletalk special internet Offer message and want to activate Teletalk 1 GB 21 Taka Recharge Internet Offer 2017 with 1month validity, just follow the below article. To activate Teletalk 1GB@21TK Internet Offer, Eligible customers need to Recharge exact 21 Taka.